Like most Austrian kids I was skiing just as soon as I could walk. I remember being between my granddads knees sliding down a small hill on our property on my little wooden skis with prehistoric Kandahar spring bindings and too large bamboo poles (they came up to my ears). When I was about seven years old, I was allowed to ski pretty much any hill with my ski crazy elders and at age ten I had a national ski pass good for any hill in the country. 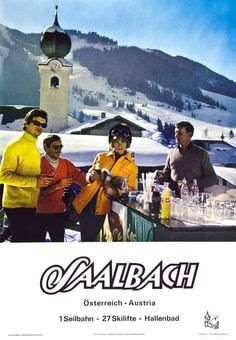 Below is a poster of my very favorite ski area back home: Saalbach. ELEGANCE Elegance - I wish I had it! When I grew up in my grandparent's home in Austria in the 50's, "Elegant" was a painting by Gustaf Klimpt (above is an excerpt of his wonderful painting "friends"), or my grandfather's portrait of the great conductor Herbert von Karajan, complete with his shock of white hair, baton poised, ready to conquer the Salzburg Music Festival. I actually attended some master classes by Karajan at the Mozarteum and he was truly "elegant" in his subtle nuances, the underpainting of his orchestral readings, the muted brasses, the almost inaudible oboes. Once again I am sitting here, completely solitary. 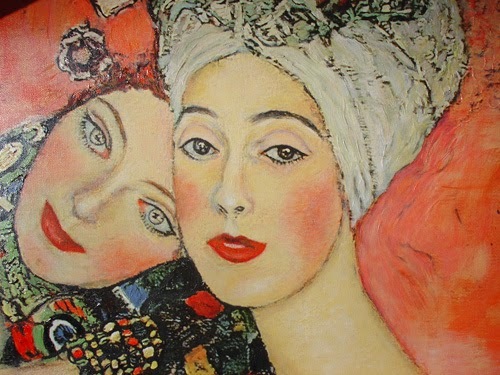 This is of course my own fault as after Nancy's death I isolated myself, first because I was devastated, then because it simply became easier to immerse myself in my paintings, sculptures, wood work, music and books. I have one great friend in Eddie Vos from Sutton, Quebec, who visits at least twice every week and without his incredible friendship I would have become completely lost by now. Yet, after the first four weeks of daily hospital visits for radiation treatments or chemo therapy for advanced stage cancer of the Esophagus, it would be nice to have someone to speak to when needed, if even just by telephone. Loneliness is almost as bad as the specter of possibly incurable cancer. But I created this environment so I best learn to live with it. This was the full name of Pablo Picasso when he was born in Malaga, Spain in 1881. On our second afternoon at his villa in Mougins, France, he wrote this down for me because we had engaged in making fun of the long names of some aristocrats still holding sway in the casinos and beach resorts of Europe. "My work has always been parsed into 'periods' but if this were so, God had his creative periods as well. On the first day He created the heavens and the earth...I call that His 'blue period' mused Pablo Picasso on the rear terrace of his home L'Antre du Minautore in Mougins, France on Friday, October 11 1968. Tamara and I had arrived at noon, escorted by a representative of a Mougins gallery favored by Picasso, a gentlemen who had been instrumental in helping me to secure an interview with the greatest living painter of that time. We had flown to Cannes and had rented a fine Peugeot for the drive to the coast. Mougins is a commune in the Alpes-Maritimes department in southeastern France. It is located on the heights of Cannes, in the district of Grasse. Mougins is a 15-minute drive from Cannes. On the evening of November 22, 1963 I was walking home from college with my friends Martin Abel and Heinz Kretzky when we saw a large group of people gathered around the local Phillips TV and radio shop. The place customarily had a large television console in its window and two speakers mounted outside so that people could enjoy some free entertainment. Not too many folks back home in Linz, Austria, could afford a television set and even those who had one grumbled about the high taxes the government had levied on the use of a radio or TV set. Our programming was pretty crappy then also as we had the official stations and with some decent antenna manipulating one could possibly get the station from Munich which did nothing but American programming such as "Father Knows Best" or "Lassie".